Melodie Ramone has written an epic love story. Silvia Cotton has battled with love from a very young age; the need for love and acceptance becomes her driving force. Orphaned by her mother while still a toddler, she must deal with her father's inability to offer her the affection she so needs. Smart and fiery, she focuses on the only way she knows to gain the acceptance and recognition she so craves by throwing herself heart and soul in becoming a top-notch student. Then one day, a fellow student, Oliver, hits her in the head with a ball and her destiny is forever changed. 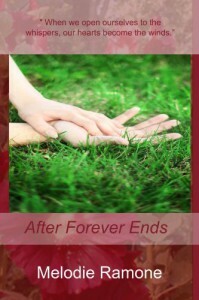 After Forever Ends, stands apart from the typical romance story -- it affirms the power of love that sustains you even after death has claimed a loved one, and it depicts love as a strong magic...that comes from deep within the source of all creation. A wonderful journey into the spiritual side of love with characters that will remain with you long after the author has finished her story.